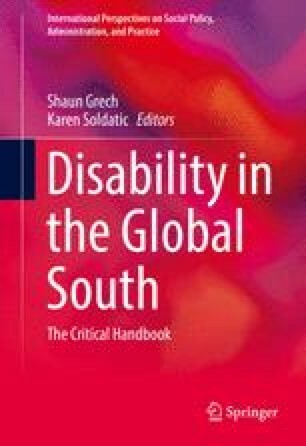 Meekosha (2011) maintains that research and theories about disability derive mainly from the global North. Disability studies rarely include non-metropolitan thinkers. Even when it does, this research tends to be seen as context specific, and the social theories which emanate from these studies are rarely referred to in research theorizing disability in the North. This chapter sets out to investigate how this one-way transfer of knowledge affects the way disability studies is conceptualized—whose experiences are incorporated and whose are left out. Multilateral debate and dialogue between disability studies academics and activists in different locations around the world would help add to the knowledge already available in the field, while keeping others informed about what is taking place in ‘similar’ situations elsewhere. Chetcuti, K. (2014, February 2). Half of 25-34 year-olds still living with parents. Timesofmalta.com. Retrieved April 6, 2014, from http://www.timesofmalta.com/articles/view/20140202/local/half-of-25-34-year-olds-still-living-with-parents.505083. Ghosh, B. (1998). The postcolonial bazaar: Thoughts on teaching the market in postcolonial objects. Retrieved April 30, 2008, from http://jefferson.village.virginia.edu/pmc/text-only/issue.998/9.1ghosh.txt. Hiranandani, V. (2005). Towards a critical theory of disability in social work. Critical Social Work, 6(1). Retrieved September 9, 2013, from http://www1.uwindsor.ca/criticalsocialwork/towards-a-critical-theory-of-disability-in-social-work. Miles, M. (2007). International strategies for disability—related work in developing countries: Historical, modern and critical reflections. Retrieved July 28, 2014, from http://www.independentliving.org/docs7/miles200701.pdf.